It’s never a good idea to ignore oil puddles that are accumulating under your car. When ignored, leaking oil can seep onto the hot parts of your engine. 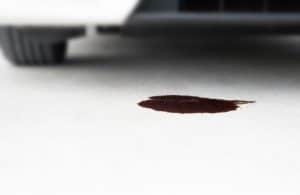 What’s more, it can drip onto your driveway or garage floor, creating environmental hazards, safety hazards, and unsightly stains. Fortunately, you can fix oil leaks yourself by using a quality engine oil stop leak product, such as BlueDevil or Lucas Engine Oil Stop Leak. If you’re not familiar with these products, read along to learn more about how they work. There are countless engine oil stop leak formulas on the market, making it difficult for customers to choose just one. We’ve narrowed down our option to the top two engine oil stop leak products. These include BlueDevil and Lucas Engine Oil Stop Leak. In terms of versatility, Lucas oil can be used in nearly any vehicle, including classic cars, everyday cars, and big rig trucks. It’s also compatible with petroleum, semi-synthetic, and full synthetic oils. The Lucas formula consists of proprietary additives and specifically formulated base stocks that renew worn seals without causing damage or corrosion. On top of that, this formula successfully reduces engine noise, which is something that BlueDevil cannot do. On the other hand, BlueDevil can be used with all gasoline and diesel engines. It is nonclogging and noncorrosive. The formula simply reconditions worn gaskets and seals. While it doesn’t reduce engine noise, it does boost engine performance. Check out this video for a customer testimony on BlueDevil Stop Oil Leak. As you can see, this product has enabled this driver and others to put off costly car repairs. Both of these products are extremely easy to use. They both rejuvinate hardened or brittle seals in high-mileage vehicles without risking further deteriorion. Keep in mind that a 1-quart bottle of Lucas Oil Engine Stop Leak is cheaper than BlueDevil Oil Stop. Both of these products should be used around the time of each oil change. As such, if you are looking for the most affordable option, Lucas Oil Engine Stop Leak is your best bet. Many customers have given these products positive reviews. In fact, many people have claimed that a single bottle of Lucas or BlueDevil has prevented them from having to constantly top off their oil tank. On top of that, both of these products are known to improve multiple engine performance factors. While some customers have said that these products did not successfully stop their oil leaks, we could not find a single report that BlueDevil or Lucas Engine Oil Stop Leak caused engine damage. Still, there are plenty of before and after videos that demonstrate a successful application of engine top oil leak formulas. Since adding an engine oil stop leak formula is relatively low-risk, we recommend giving it a try. Use cardboard or paper towels to measure the level of leakage before and after using a stop oil leak formula. 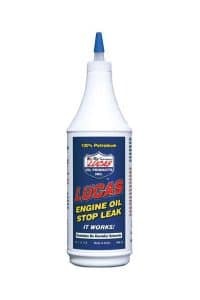 Lucas Engine Oil Stop Leak is engineered to stop engine oil leaks caused by worn seals. At the same time, it reduces engine noise and oil consumption. On top of that, it raises oil pressure without risking damage or corrosion to an engine. The Lucas Engine Oil Stop Leak blend consists of Lucas-brand additives and specially formulated base stocks. It does not contain any harmful solvents. 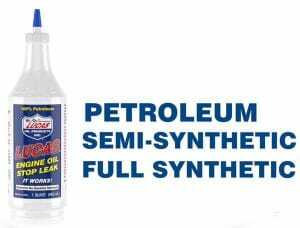 It is compatible with petroleum, semi-synthetic, and full synthetic motor oils. If you’ve noticed small amounts of oil pooling in your driveway, it can’t hurt to toss a bottle of Lucas Engine Oil Stop Leak into the engine. 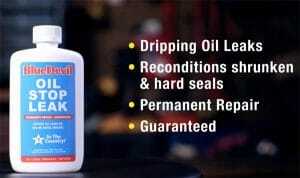 It should do a great job of thickening up your engine oil and sealing some of the gaps in the engine’ss seals. Lucas products are favored by mechanics. Since this formula stops leaks and improves engine performance, it’s a favorite remedy for those who don’t want to shell out thousands of dollars for a seal or gasket repair. On top of being a favorable product, we love that the Lucas Engine Oil Stop Leak comes in an easy-to-use nozzle-topped bottle. After all, you don’t need more than one puddle on your hands. Lucas oil additives are petroleum-based products that lubricate the components of an engine. They reduce the amount of friction, heat, and subsequent wear and tear produced by oil leaks. The Lucas Engine Oil Stop Leak has an API gravity of 21.1. It has an amber color and a viscosity of 38 at 100-degrees Celsius cSt. Check out this Lucas Engine Oil Stop Leak promotional video to learn more about it. BlueDevil Oil Stop Leak is yet another powerful oil leak stopper. It works by closing up worn seals and gaskets. BlueDevil is safe for most engines. It is also very easy to use. It does not cause clogs, corrosion, or wear. BlueDevil is well-suited for all gasoline and diesel engines. BlueDevil is a great option for vehicle owners who don’t want to invest in a hard part replacement. It’s capable of reconditioning hard or shrunken gaskets. The best part is you can stick to your regular oil change schedule when adding BlueDevil. Like Lucas, BlueDevil has developed a positive reputation amongst professional mechanics and D.I.Y. car tinkerers. While this product works well on seals, it has some trouble restoring large gaskets. Still, that’s a small price to pay for a formula that is safe to use and easy on your vehicle. 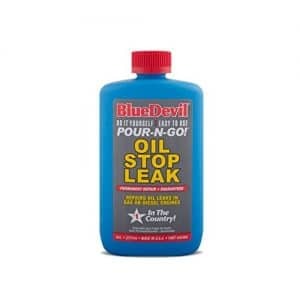 BlueDevil Oil Stop Leak is a clear odorless liquid. Its chemical name is Diethylene glycol. A full list of its safety stats can be found here. If you’re more of a visual learner, check out this BlueDevil promotional video on the beloved BlueDevil Oil Stop Leak formula. Oil leaks are all too common in high-mileage vehicles, but accessing and replacing faulty seals and gaskets isn’t always worth the effort or dough. Oil stop leak formulas were developed to help vehicle owners save money and time. These simplistic f ormulas can be poured directly into a vehicle’s engine to help seal up worn, hardened, or shrunken seals. What is engine stop leak oil? The first engine oil stop leaks were designed to actually clog up engine seals and gaskets. According to BlueDevil Products, the first oil stop leaks actually contained castor oil and pulverized nut shells. Of course, hefty additives like these were detrimental to vehicle engines. As such, they were quickly faded out of use. Seal conditioners were later added to engine stop oils in order to swell engine gaskets and seals. However, mechanics discovered that this caused the gaskets and seals to deteriorate at a faster rate. Most modern engine oil stop leak formulas are additive-free. They are formulated to be absorbed by gaskets and seals. This type of intervention enables longterm benefits. In fact, gaskets and seals are able to resume their original form without deteriorating. Do engine oil stop leak formulas work? Yes and no! Engine oil stop leak can rejuvenate engine oil seals. While engine seals and gaskets aren’t expensive, they are often located in hard-to-reach places. In fact, you often need to remove the entire transmission just to replace a single gasket. While some mechanics are eager to label engine oil stop leak formulas snake oils, a continuously growing number of positive customer reviews tells a different story. Many drivers are skeptical of using cure-alls like engine oil stop leak. In fact, most people need to try it for themselves before they can attest to its ability to stop a leak. Keep in mind that some leaks may be too severe for such remedy to prevent them. What causes engine oil leaks? Almost all engine oil leaks are caused by worn or degraded engine gaskets and seals. Still, you will want to make sure your oil pan drain plug is securely attached before assuming you have a faulty connection elsewhere. Are you unsure if your vehicle is leaking oil? There are the most obvious indications that your vehicle is leaking oil. Dark Puddles: Dark, greasy stains are a tell-tale sign that your vehicle is leaking oil. Take a look under your car to see if oil is spilling out on to the pavement. Blue Smoke: When oil leaks from a gasket or seal, it can drip onto the exhaust manifold or other heated engine components. This causes it to burn and create smelly, sometimes blue, smoke. When engine oil is allowed to burn outside of the engine, it can destroy imperative engine components, such as sensors and gaskets. Strange Smells: If engine oil is smoking under your hood, it can give off a distasteful smell. 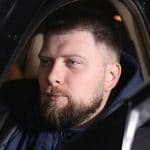 The smell of burning oil is thick and suffocating. On top of that, if you have an oil leak, you may be able to smell your overheating engine. Low Oil Indicator Light: If your vehicle’s oil level is lower than it should be, your vehicle’s low oil indicator light or low oil pressure light may flicker on. If you’ve been getting regular oil changes, this may serve as an indicator that your oil is leaking. Not an Oil Leak: Remember, there are other liquids that could be leaking from your car. Antifreeze, for example, is bright green. Brake fluid is clear or yellowish in color. What’s more, automatic transmission fluid is red. Your car may even form a puddle of water when you are running the air conditioner. If you suspect that something is leaking from your car, it’s never a bad idea to contact a mechanic. They can help you diagnose the issue and steer you in the right direction. 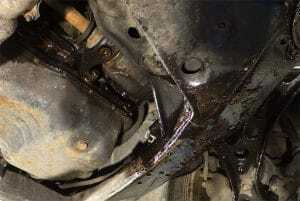 What types of engine oil stop leaks should I avoid? 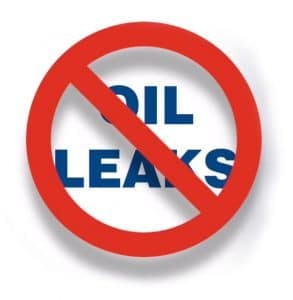 Do not purchase engine oil stop leaks that contain particulates or distillates. Petroleum distillates can accelerate the damage to your seals and gaskets. Distillates do this by overswelling already degraded seals. 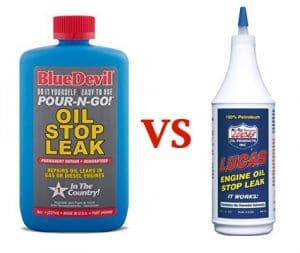 Pour one 8-ounce bottle of BlueDevil or Lucas Engine Oil Stop Leak into your vehicle’s oil sump or crankcase. Keep in mind that one 8-ounce bottle treats 4 to 6 quarts of motor oil. Start your vehicle’s engine. Then, drive it for 1 to 2 hours or until the leak has stopped. It is worth noting that larger leaks take longer to seal. Still, most will seal in 15 to 30 minutes of driving or idling. According to BlueDevil Products, extreme leaks may require 2 days of drive time to stop. BlueDevil also claims that their Oil Stop Leak permanently stops leaks. Measure out 20 percent of your system’s oil capacity. 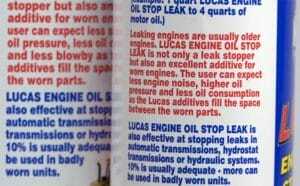 For example, use 1 quart of Lucas Engine Oil Stop Leak for four quarts of motor oil. Pour it into your vehicle’s crankcase or oil sump. Run the vehicle for 15 to 30 minutes or until the engine ceases to leak. How do I find the source of my oil leak? If you know your way around an engine, you may be able to pinpoint the source of your oil leak. However, the vast majority of vehicle owners will want to leave this task for a professional mechanic. If you’re willing to poke around before sending your vehicle off to the mechanic, use a flashlight or floodlight to identify oil residue on the engine. 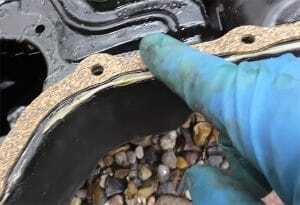 Oil that is spread far and wide is usually indicative of an engine gasket leak. On the other hand, oil that sprays liberally when a vehicle is running is often caused by a worn crankshaft or seal. What happens if I let my vehicle loose too much oil? Engine oil is used to lubricate the pistons in a vehicle’s engine. Engines that are run on reduced oil are highly susceptible to degradation. In fact, a lack of oil can cause an engine to quickly overheat. This is because oil is quickly recirculated without an opportunity to cool down. Rapidly degraded oil leaves behind all sorts of harmful sludge and deposits. This puts your engine at risk. What is an engine gasket or seal? Engine gaskets are engineered to create an airtight seal. They consist of a metal ring coated in rubber or other synthetic materials. The high heat and extreme conditions in engines can cause these seals to harden or become brittle over time. Without an airtight connection, these seals can seep or even squirt out oil. This can lead to egregious oil consumption or waste. One of the most common engine seals to go is the rear main seal. Unfortunately, this and many other seals are buried deep in the back of a vehicle’s engine. Is engine oil stop leak the same as oil stabilizer? Oil stabilizer is designed to stop dry starts, reduce friction, and eliminate heat-related wear. It is typically used to thicken oil. Still, it does not work in the same way that engine oil stop leak formulas do. What causes seals to break? Seals can deteriorate with age. Continued exposure to harsh environmental and chemical elements can speed this process up. As such, engine oil leaks are most commonly seen in old or high-mileage vehicles. While seals are not incredibly costly, replacing them is extremely labor-intensive. Many vehicle owners look toward engine oil stop leak concentrates as a last-ditch alternative to trading in their vehicle. When are engine oil stop leak formulas not a good idea? Engine oil stop leak can help budget-minded drivers avoid environmental and vehicle destruction. However, this miraculous formula can’t seal up all leaks. Drivers with degraded valve cover gaskets do not have much success using engine oil stop leak formulas. Leaks must be small or moderate in size. Major leaks need to be replaced. Is oil stop leak dangerous to use? You should always use caution when using engine oil stop leak concentrates. Do not allow the concentrate to come in contact with your eyes or skin. We recommend wearing gloves or protective clothing. Always turn your vehicle off before opening the crankcase. Remember, the engine and engine liquids can be very hot. Engine oil stop leak formulas are proven to do exactly what they promise. These relatively simple formulas can be added to almost any engine in order to stop leaks in their tracks. Engine oil stop leak formulas have come a long way since the times when they were made with ground nuts and castor oil. With a bit of trial and error, manufacturers have developed safe and effective formulas that can be used by individuals with very little mechanical knowledge. 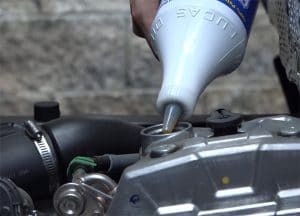 Whether you opt for the BlueDevil or Lucas Engine Oil Stop Leak, there’s little risk in adding an engine oil stop leak concentrate to your vehicle’s engine. In fact, most vehicle owners will notice results in just one to two hours.